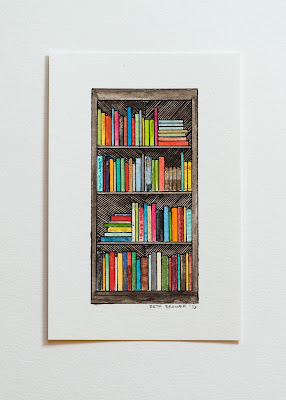 Beth Brower Bookshelf Painting Giveaway! I've got an extra special giveaway today to celebrate the release of Beth Brower's debut novel The Queen's Gambit. Not long ago, I posted the amazing painting of my library she gifted me for Christmas. Now, she's selling an entire line of beautiful bookshelf paintings on her website. Be sure to check them out here. Each bookshelf is its own unique piece of art, signed and dated by year. Today, she's kindly offered to do a giveaway to celebrate the book's release. One person will win the original 4x6 bookshelf painting pictured below. To enter, simply fill out the Rafflecopter. The giveaway is open internationally and will run through Tuesday, January 26th. Good luck!